A three-sport star in high school, Don Gullett became a professional baseball player at the age of 18. After a short stint in the minors, he became the mainstay of the Cincinnati Reds pitching staff. Before he was 25 years old he was being compared to Sandy Koufax and seemingly was headed for Cooperstown. But misfortune struck. In short order he suffered a broken thumb, a dislocated ankle tendon, injuries to his neck and shoulder, and as the last straw a double tear of his rotator cuff, from which he was unable to recover. He pitched his last major-league game at the age of 27, his dreams of the Hall of Fame over too soon. Donald Edward Gullett was born on January 6, 1951, near Lynn, Kentucky, in Greenup County in the northeastern part of the state (and across the Ohio River from Portsmouth, Ohio). The sixth of eight children of Lettie and Buford Gullett, he grew up playing baseball and basketball with his brothers. His younger brother, William, played for one minor league season with the Detroit Tigers’ organization. In addition to playing sports, he enjoyed hunting and fishing with his father. But it was not all play for the youngster. To supplement the family income, as a teenager he worked on neighboring farms in the summers, pitching bales of hay and doing other strenuous tasks. Gullett attended McKell High School in South Shore, Kentucky, where he compiled an amazing athletic record. As a senior he was All-State in baseball, basketball, and football. His exploits on the gridiron made him a schoolboy legend. In one game against Wurtland High School he scored an unbelievable 72 points as he ran for 11 touchdowns and kicked 6 extra points. He once scored 47 points in a basketball game against Wurtland, and was recruited by major colleges for both basketball and football. “But I always knew baseball was my first love,” he said.1 His record for McKell High School was about 30 wins and four losses. His best performance came when he pitched a perfect game, striking out 20 of the 21 batters he faced. Drafted by the Cincinnati Reds in the first round of the 1969 amateur draft, the 14th pick overall, young Gullett was signed by scout Gene Bennett for a reported bonus of $25,000. He was at first assigned to Bradenton of the rookie-level Gulf Coast League, but never played there. Instead he was sent to Sioux Falls (South Dakota) of the Single-A Northern League. During the two-month season he won seven of nine decisions, compiled a 1.96 earned-run average, and struck out 87 batters in 78 innings. Then he returned to (Kentucky’s) Greenup County and married Cathy Holcomb, a cheerleader whom he had met when both were students at McKell High School. Gullett’s short stint with Sioux Falls comprised the whole of his minor-league experience. He went to spring training with the Reds in 1970 as a nonroster invitee. (Married for less than three months, Cathy wanted to accompany her husband to Florida, but she had to finish high school.) At 6 feet and 190 pounds, Gullett was powerfully built and could really fire the fastball. “I was exceptionally impressed with the poise shown by Don Gullett,” manager Sparky Anderson said. “Time will tell if he is ready now for the big leagues or if he still needs another year of minor-league ball.”2 Don himself had few doubts. “I figure management wouldn’t have invited me in the first place if they hadn’t felt I had a chance to make the club,” he opined.3 On April 5 Gullett was promoted to Cincinnati’s major-league roster. Gullett gave up a walk and a single with two out in the sixth, but he struck out Willie Mays to end the inning. Two days later, the Reds were leading the San Francisco Giants 6-3 with two out in the bottom of the ninth inning, when Gullett was called in from the bullpen. The rookie induced Ken Henderson to pop up for what appeared to be the game-ending final out. However, first baseman Johnny Bench and second baseman Tommy Helms collided as both went for the ball, which dropped safely, allowing two runs to score. Anderson replaced his young moundsman with Wayne Granger, who got the final out to preserve the 6-5 victory. Cincinnati won the National League West in 1970 and swept Pittsburgh in the NLCS. Gullett picked up two saves. In Game Two he relieved in the sixth inning with the Reds leading 2-1, with two Pirate runners on and two outs, and Willie Stargell at the plate. Gullett retired Stargell on a fly ball to right field, struck out the side in the seventh, and saved the game by pitching hitless ball over the final 3⅓ innings. In Game Three the drama was packed into the top of the ninth inning as the Reds led, 3-2. With two outs and Roberto Clemente on first base, Anderson again brought Gullett in to face Stargell, who singled, sending Clemente to third base as the potential tying run. Up came Al Oliver, who grounded out to second base to end the game and win the NL pennant for the Reds. In the World Series against the Baltimore Orioles, the Reds lost in five games. Gullett pitched well, appearing in three games and giving up only one run in 6⅔ innings, but he was unable to pick up a save. In 1971 Gullett became a full-time starter, winning 16 games while losing six, leading the league in winning percentage with .727 and posting an exemplary 2.64 earned-run average. In the fourth start of his major-league career, Gullett pitched his first complete game, shutting out the Dodgers 2-0. 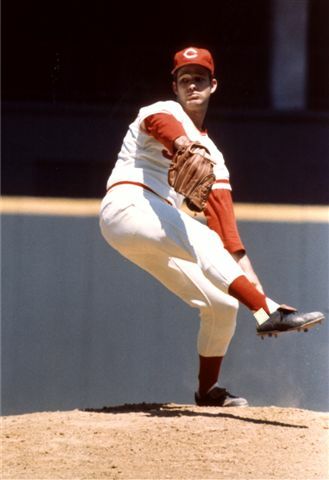 Despite his stellar work, the Reds had a losing record of 79-83, so he had no postseason opportunity in 1971. Bad luck struck Gullett in 1972. His strength was sapped; his fastball slowed; he tended to tire early in games. After undergoing tests, he was diagnosed with hepatitis. When he was well enough to return to the mound, Anderson assigned him to the bullpen. That year Gullett had the only losing season (9-10) in his entire career. Without much help from their young pitcher, the Reds still came out on top in the National League West. To the surprise of almost everybody Anderson selected Gullett to start the first game of the NLCS against Pittsburgh. The Pirates scored three runs on four in the first inning to take a lead they never relinquished. Gullett went six innings and allowed five runs to suffer the loss. The Reds took two of the next three games to tie the series at two wins apiece. Gullett started the deciding Game Five. He pitched into the fourth inning before Anderson replaced him with Pedro Borbon with the Reds on the short end of a 2-1 score. Borbon immediately gave up another hit to give the Pirates a 3-1 lead. However, the Reds rallied and won a dramatic game 4-3 by scoring two runs in the bottom of the ninth. In the World Series the Reds lost two of the first three games to Oakland. Anderson nominated Gullett to start Game Four. The southpaw pitched well enough for seven innings, holding the A’s to only one run on five hits, but the Reds were unable to score, and Gullett departed for a pinch hitter trailing 1-0. The Reds rallied to take a 2-1 lead in the eighth inning, and Gullett stood to be the winning pitcher until the A’s scored two runs in the ninth to win, 3-2. Oakland won the Series in seven games. With his strength not yet fully restored after his bout with hepatitis, Gullett spent over a month of the 1973 season in the bullpen. Nevertheless, after closing the season with nine consecutive victories, he posted a career high 18 wins while losing eight. During a no-decision, on August 18, Gullett surrendered the 660th and final career home run hit by Willie Mays. The Reds won the National League West again in 1973, but lost the NLCS to the New York Mets three games to two. Gullett started Game Two and pitched very well, but Jon Matlock of the Mets was even better. Don was lifted for a pinch-hitter in the fifth inning with his team trailing 1-0. In Game Four Gullett relieved Fred Norman in the sixth inning, and pitched four innings of shutout baseball, keeping the score tied at 1-1. Clay Carroll got credit for the win when Pete Rose hit a 12th-inning home run to give the Reds a 2-1 victory that evened the series at two games. However, Tom Seaver wrapped up the series for the Mets with a 7-2 win in the fifth game. Gullett relieved in the critical fifth inning of Game Five and walked the only Met batter he faced. In 1974 Anderson said, “It’s the only Hall of Fame battery active in baseball today.” The manager was speaking of Johnny Bench and Don Gullett. “Barring an injury, (Gullett) is almost sure of making the Hall of Fame. With Gullett’s body and the way he stays in shape, I know he’s going to pitch until he’s at least 35. So, doing that you know he’s going to win at least 250 games with the start he has. And anything over 250 has to rate a pitcher serious consideration for the Hall of Fame.”7 Sparky had the one caveat—barring injury. And injuries would eventually keep Gullett from attaining the career victory total Anderson predicted. Anderson had good reason to expect great things for the young left-hander. The three best southpaws of the previous generation—Warren Spahn, Whitey Ford, and Sandy Koufax—were in the Hall of Fame. When Gullett celebrated his 25th birthday in 1976 he had already won 91 games—many more than Spahn (8), Ford (43), and Koufax (53) had won by that age. In 1975 Gullett got off to an excellent start. By June 11 he had already won eight games against three losses and had a 2.09 earned-run average. He seemed on his way to the All-Star Game and a 20-win season. But disaster struck on June 16 in the ninth inning of a game against Atlanta. When making the second out, Larvell Blanks hit a line shot that fractured the pitcher’s left thumb. Gullett earned his ninth victory, but was sidelined for two months. When Gullett returned from the disabled list on August 18 he hurled five scoreless innings in a 3-2 Reds victory over St. Louis. It was an extraordinary performance, considering that he was pitching after a two-month layoff. “I feel like a music teacher watching a great pianist at work,” said pitching coach Larry Shepard, “He gives me goose bumps.”8 In the remainder of the season the lefty won five more games and lost one to finish the year at 15-4. With their star pitcher healthy again, the Reds easily captured the NL West and took on the Pirates again in the NLCS. Gullett started the first game for the Reds and went the distance, winning 8-3. His biggest thrill came not from his pitching, but from his hitting. He batted in three runs with a single and a home run. The homer was the first, and only, of his major-league career and the first ever by a pitcher in an NLCS game. “It was really exciting. I’m elated,” the young man said. “It was my greatest day in my life in baseball.”9 But, he added, it was not his greatest day in sports, not equal to the 11-touchdown game against Wurtland. The Reds ousted the Pirates in three straight games and qualified to face the Boston Red Sox in the 1975 World Series. Gullett faced Luis Tiant in the Series opener, and the game was a pitchers’ duel for six innings. Plagued by unaccustomed wildness, Gullett gave up seven hits and four walks during the first six innings and had to wriggle out of several jams, but he did not allow any runs until the seventh inning. Tiant led off that frame with a single to left. Dwight Evans bunted back to the pitcher. Instead of taking the easy out at first base, Gullett attempted to get Tiant going to second. Gullett slipped, threw wildly, and both runners were safe. Suddenly there were two runners on base and nobody out. Denny Doyle singled to left and the bases were loaded. Carl Yastrzemski drove Tiant in with a single to right for the first run of the game. Gullett was removed, but the uprising continued against relievers Clay Carroll and Will McEnaney. The Red Sox scored six runs in the inning en route to their 6-0 victory. With the Series tied at two games apiece, Gullett faced Reggie Cleveland in Game Five. The lefty gave up one run in the first inning and didn’t give up another hit until the eighth. The Reds took a 6-1 lead into the ninth, but Gullett weakened, giving up two singles and a double before Rawly Eastwick relieved to get the final out and preserve the victory. After the Series was delayed three days by rain, Boston won Game Six, on Carlton Fisk’s dramatic 12th-inning home run. Gullett was well rested for Game Seven—perhaps too well rested. He hadn’t pitched in six days. In the third inning he gave up two hits and walked four to fall behind 3-0, despite striking out the side. Gullett lasted four innings before Merv Rettenmund batted for him in the fifth. “I wanted to go with Gullett,” Anderson said later. “I stayed with him a long time. But after it was three nothing, I had to pinch-hit for him.”10 The Reds came back to win the game, 4-3, and the world championship. The 1975 World Series replaced that Wurtland game as Don’s biggest thrill in sports. After the Series was over Gullett went back to his Greenup County farm and his Black Angus cattle. He had purchased 75 acres on a farm where he had pitched hay as a teenager. The deeply religious Gullett told a national television audience, “I’d like to thank my Maker who gave me the ability to go out and pitch in a World Series.”11 He gave additional religious testimony over television, which led to his invitation to speak to many church groups. Gullett practiced what his religion taught. Drinking, carousing, womanizing, and a wild nightlife were not part of his lifestyle. For recreation he preferred hunting, fishing, and listening to country music. Anderson expected great things from his ace pitcher in 1976. The manager asserted that Gullett was the best left-hander in the National League. “Barring another injury,” Anderson said, “I figure Don’s a cinch to win 20 or more this season.”12 However, Gullett could not avoid injury. On May 20 he suffered a muscle spasm in his neck, which kept him out of action until June 5. In late July he came down with neck and shoulder miseries that sidelined him until the end of August. An inflammation between his left shoulder and his neck bothered him all season. Despite these difficulties, Gullett won 11 games and lost only three in 1976, for a winning percentage of .786. His earned-run average was a very respectable 3.00. By October the southpaw was ready for the postseason. The Reds won their division again and swept Philadelphia in the NLCS, three games to none. Gullett pitched a gem in the opening game of the series, giving up only two hits and one run in eight innings. Eastwick allowed two runs on four in the bottom of the ninth, but held on as the Reds won 6-3. The New York Yankees won the American League pennant, and the Reds swept them in four games in the fall classic. Gullett was Cincinnati’s pitcher in the opening game. He had a 5-1 lead through seven innings. In the top of the eighth Gullett retired Mickey Rivers, the first batter he faced, but hurt his ankle on his last pitch to the Yankee center fielder. When Roy White followed with a single to left, the Reds’ pitcher grimaced in pain. Anderson came to the mound, and Gullett left to a standing ovation. Borbon relieved and preserved the victory. X-rays revealed a dislocated tendon in Gullett’s right ankle, and the ankle was placed in a cast. The Reds won the next three games to become the first National League club to win two consecutive world championships since the New York Giants of 1921 and 1922. In 1976, veteran players with expiring contracts could play out their options and become free agents for the first time in history, and Gullett chose this path. His agent, Jerry Kapstein, had asked for a longer contract than the Reds were willing to offer. A dozen clubs bid for his services, and the New York Yankees prevailed with a six-year two-million dollar contract). They recognized that the pitcher had a history of injury problems, but noting that the young man had the best winning percentage among active pitchers, they were willing to gamble on his health. During the offseason baseball’s newest millionaire took a sportswriter on a tour of his Greenup County farm. The reporter wrote that Gullett was quiet, courteous, respectful, and deeply religious, and knew the meaning of a good day’s work. At that time the family consisted of Don, Cathy, and two children—Don Jr. and Tracey. A third child, Angela, was born in February 1980. Because he was on the road during the baseball season, Gullett had to have help with farm work. When he could, Don did a lot of the work himself. However, the scribe wrote, he always found time for hunting and fishing. On April 10, 1977, Gullett made his debut as a Yankee. The Two Million Dollar Man, as the New York Daily News dubbed him, pitched well but gave up a pair of home runs to Sixto Lezcano as the Bronx Bombers went down to a 2-1 defeat at the hands of the Milwaukee Brewers. The injury jinx reared its ugly head again just over two weeks later. Pitching in Baltimore, Gullett slipped and fell, spraining his left ankle and pulling a neck muscle. At the end of July he missed six weeks with a sore shoulder. Still, he managed to win 14 games while losing only four and led the American League with a .778 winning percentage. The Yankees won the AL East and faced Kansas City in the ALCS. Gullett started the first game for New York and lasted only two innings, giving up four runs in his short stay on the mound during a 7-2 loss. Yankee manager Billy Martin said that Gullett had a shoulder injury and probably wouldn’t pitch again in the series. The Yankees came back to defeat the Royals, three games to two and earned another trip to the World Series. To the surprise of many, Gullett started the first game of the Series against the National League champion Dodgers. With the Yankees leading 3-2 in the ninth inning it appeared Gullett had a great chance to win the game. However, after he allowed a hit and a one-out walk, Gullett was taken out. Sparky Lyle relieved and allowed a single that the tying run. Lyle shut the Dodgers down the rest of the day, with the Yankees winning 4-3 in 12 innings. The Yankees won three of the first four games of the series. When Gullett faced the Dodgers in Game Five, his club needed only one more win to clinch the World Series. In the fourth inning Steve Yeager hit a three-run home run off a forkball that stayed high, to make the score, 5-0. Gullett was removed with one out in the fifth and eventually charged with the loss. However, the Yankees got their fourth victory and the 1977 world championship by winning Game Six. An aching left shoulder limited Gullett to only eight appearances in 1978. Before he could make his first start, he was placed on the disabled list. After coming off the DL on June 3, he won four of his first six starts, and pitched two complete games. On July 9 he faced the Milwaukee Brewers and could not get out of the first inning. He allowed four runs on three hits and four bases on balls in two-thirds of an inning and was charged with the loss. It was the last time he ever pitched in the majors, his playing career over at the age of 27. On September 29 he underwent surgery for a double tear of his rotator cuff. Although unable to play in the 1978 World Series, he was on the Yankees’ roster. Gullett is one of the few men in the history of baseball to be on the roster of four consecutive World Series champions—Cincinnati in 1975 and 1976 and the Yankees in 1977 and 1978. After the surgery Gullett was unable to pitch again. The Yankees released him on October 30, 1980. He closed out his career with 109 wins and 50 losses, for a winning percentage of .686, second only to Whitey Ford (.690) among all left-handed pitchers with a minimum of 100 wins. After his release Gullett returned to full-time farming. One morning in February 1986, while working on his farm, he complained of chest pains. Still active at age 35, strong, athletic, working on his farm, he did not seem like a candidate for a heart attack. But he was smoking up to three packs a day and consuming coffee by the gallon. He spent a month in the hospital undergoing tests. His physician, Dr. Grant Stevenson, said, “I’m puzzled by what happened to Don, other than the fact he’s still a smoker.”13 The doctor decided that no surgery was necessary, but ordered Gullett to exercise, stop smoking, cut down on coffee, go on a low-sodium diet, and take a prescription blood thinner. Gullett stopped smoking and continued working on his farm, but he was still drinking lots of coffee in 1989. He also worked as an assistant baseball coach at Greenup County High School, which had absorbed the old rivals McKell and Wurtland through consolidation. In December 1989 Gullett became a pitching coach for Cincinnati’s farm club in Chattanooga. During his first spring on the job he suffered a heart attack. In June 1990 he underwent triple-bypass heart surgery at the Cleveland Clinic. After recuperating, in 1991 Gullett coached for the farm club in Nashville. On May 24, 1993, he was back in the big leagues as pitching coach for Cincinnati. The Reds did not do well the next several years, losing more games than they won most seasons. Manager Dave Miley and pitching coach Gullett were fired on June 20, 2005. Soon there were changes at the top levels of the organization, and Gullett was back in the club’s good graces. He began working in various capacities for the Reds, most notably in their player-development program. In 1993 Gullett was inducted into the Dawahares-Kentucky High School Athletic Association Sports Hall of Fame. Could another Hall of Fame—perhaps the one in Cooperstown—have beckoned him had he not been plagued by injuries? His bust is not in Cooperstown, but his portrait is painted in a mural on the floodwall protecting downtown Portsmouth, Ohio, from the ravages of Ohio River floods. 1 USA Today, October 24, 2000. 2 Mansfield (Ohio) News Journal, March 4, 1970. 3 Cincinnati Post, May 22, 1971. 4 Newark (Ohio) Advocate, April 17, 1970. 5 Cincinnati Post, September 19, 1970. 6 Cincinnati Post, July 22, 1974. 7 Cincinnati Post, July 22, 1974. 8 Cincinnati Post, September 6, 1975. 9 Billings (Montana) Gazette, October 3, 1975. 10 George Vecsey, “Don Gullett Is Supposed to Go Straight from the Holler to the Hall of Fame,” Sport, April 1976. 12 Cincinnati Post, April 17, 1976. 13 New York Daily News, February 6, 1986.